robot n from the Czech, robota, meaning forced labour 1 a machine with a human appearance or functioning like a human 2 a machine capable of carrying out a complex series of actions automatically. The word was first used in the play, R.U.R. 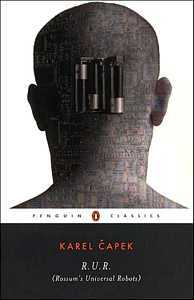 (Rossum's Universal Robots), by Karel Čapek in 1920. 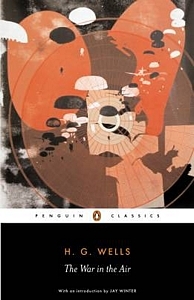 The Penguin Classics series was launched in 1946 with a new translation of Homer's The Odyssey by E V Rieu, who at Allen Lane's request became the series editor. The series was restyled by Jan Tschichold in 1947-48, and again by Germano Facetti in 1963-64, when Rieu retired and the Classics were joined by a new series, the Penguin English Library. While the Classics were all translated works, the English Library was for fiction written in English prior to the twentieth century which had also come to be regarded as classic. 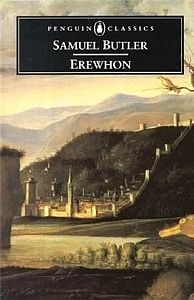 Science fiction entered the English Library in 1970 with a reissue of Samuel Butler's Erewhon, followed in 1976 by The Science Fiction of Edgar Allan Poe. Poe was American of course, and the launch of a third series specifically for American fiction in 1981 saw him joined by Edward Bellamy, another nineteenth-century sf writer whose Looking Backward appeared in the Penguin American Library in 1982. When David Pelham resigned as Penguin's art director in 1979 he was replaced by Cherriwyn Magill, who in turn was succeeded by Steve Kent in 1984. 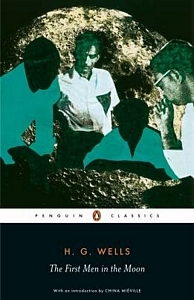 The following year was Penguin's fiftieth anniversary and a new Penguin Classics design was introduced with a black and cream livery: black for the spine and a text box on the front cover, cream for the back cover and the border on many, though not all, of the front covers. The top of the spine also featured a small band of colour which was red for English-language authors, yellow for European, green for oriental, and so on. Over the years that followed the titles in the English and American Libraries were reissued as Penguin Classics and the two libraries were discontinued. The first sf to be elevated to a Classic was Butler's Erewhon, followed by Bellamy's Looking Backward, the Poe anthology and Edwin Abbott's Flatland. American Art in New York City. se dirige vers L'INFINI), 1878, by Odilon Redon, at the Bibliothèque Nationale in Paris. Reissued in Penguin Classics 1998 with an introduction by Alan Lightman. 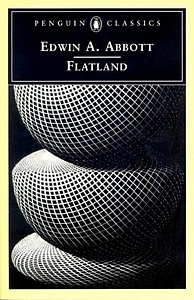 The cover shows Three Spheres I (1945) by M C Escher. Arthur Conan Doyle is best known as the creator of Sherlock Holmes but the stories he wrote about an irascible zoologist are no less entertaining. The hot-tempered Professor Challenger made his debut in The Lost World when he takes three men up the Amazon to prove his claim that dinosaurs exist on a prehistoric plateau located deep within the jungle. But there is trouble ahead, for the men become 'marooned among the creatures of a bygone age' and are ambushed by apemen. "Missin' Links", grumbles one of the group, "and I wish they had stayed missin'". 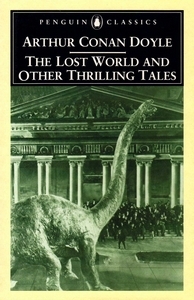 The novel lent its name to a subgenre of 'lost world' stories such as Jules Verne's Journey to the Centre of the Earth in 1864, Edward Bulwer-Lytton's The Coming Race in 1871, Edgar Rice Burroughs' The Land That Time Forgot in 1918, James Hilton's Lost Horizon in 1933 and Joseph O'Neill's Land Under England in 1935. But are such stories really sf? 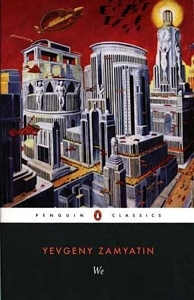 The Penguin Classic shown below calls The Lost World science fiction and that alone merits its inclusion here, but it is one of the Other Thrilling Tales that clinches it. For in Doyle's apocalyptic novella The Poison Belt the four explorers of The Lost World gather for a reunion at Challenger's house on a day when the Earth is engulfed by toxic ether. Across the globe entire populations drop like flies and it seems that the end of the world is nigh. A novel, a novella and two short stories, first published individually in 1912-13. Published in Penguin Classics July 2001 with an introduction by Philip Gooden. by the American director Harry Hoyt. "I'm expecting the end of the world today, Austin." "Yes, sir. What time, sir?" "I can't say, Austin. Before evening." Arthur Conan Doyle, The Poison Belt (1913). 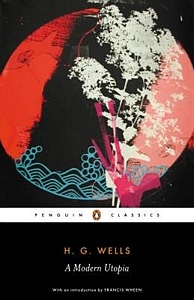 Steve Kent's design for the Penguin Classics remained in use for eighteen years but eventually it passed its sell-by date and in 2003 it was replaced by the design that is still in use today. Overseen by Penguin's current art director Jim Stoddart, the new design has abolished the old cream border and relocated the text box to the lower part of the cover. 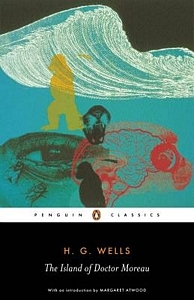 The logo and Penguin Classics label sit above the text box in a narrow white band, like the wraparound belly-bands used for some trade editions and French paperbacks, and the artwork fills the space above that. First published 1921 as Rossumovi univerzální roboti. 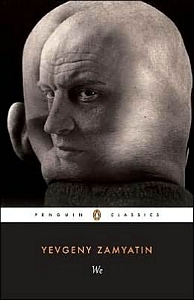 Published in Penguin Classics (USA) March 2004 with an introduction by Ivan Klíma. The cover photograph is by Bob Elsdale. The sf titles released as restyled Classics includes one that Penguin hadn't published before. Karel Čapek's R.U.R. is not the only sf play ever written but it is the most famous, as it gave the world the word 'robot' although, as Čapek himself pointed out, it was his brother Josef who coined the word. Reissued in Penguin Classics March 2005 with an introduction by Margaret Atwood. The cover illustration is by Kate Gibb. 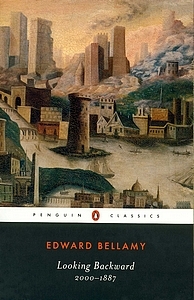 Reissued in Penguin Classics March 2005 with an introduction by China Miéville. Published in Penguin Classics March 2005 with an introduction by Francis Wheen. Published in Penguin Classics March 2005 with an introduction by Patrick Parrinder. Reissued in Penguin Classics May 2005 with an introduction by Jay Winter. Published in Penguin Classics May 2005 with an introduction by John Clute. Reissued in Penguin Classics (USA) July 2006 with an introduction by Jonathan Auerbach. The cover shows John French Sloan's cover art for The Masses magazine in June 1914, which leads with an article on the Ludlow massacre, titled "Class War in Colorado". 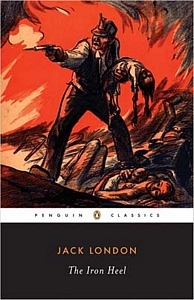 Penguin first published The Iron Heel in 1945 but had not reprinted it in over sixty years so its reissue was long overdue. The cover may seem somewhat sensational but its depiction of the Ludlow massacre resonates deeply with London's tale of class war in the USA. For in 1914, seven years after the novel was first published, the Colorado National Guard opened fire on 1,200 striking coal miners and their families in Ludlow (now a ghost town), killing six men, two women and eleven children. Reissued in Penguin Classics August 2006 as a sixtieth anniversary edition with an introduction by Marina Warner. The cover illustration is by Kate Gibb. Burroughs' first novel A Princess of Mars is pulp fiction par excellence in which an out-of-body experience transports John Carter – gentleman of Virginia and veteran of the American Civil War – to Mars, or Barsoom as the locals call it, where he is soon fighting great white Barsoomian apes and beating some manners into the tusked green Tharks, before setting off to rescue the book's titular princess, who, as the cover reveals, is the stuff of many male sf readers' dreams: a beautiful, near naked, egg-laying Heliumite. 'Love conquers all', wrote the Roman poet Virgil, and Carter shows that this includes Warhoons and Zodangans. But there's more, for when the Atmosphere Factory breaks down and life on Mars faces death by asphyxia, there is only one man who can save the planet. It's a race against time but he might just do it. The novel brought Burroughs instant success and three months after its concluding instalment, the October 1912 issue of The All-Story magazine published his second novel in its entirety. It was heavier on apes, though not from Barsoom, and in fact it was not sf at all, for this was the story of little Lord Greystoke, the orphaned son of English aristocrats who is raised by apes in Africa. Tarzan of the Apes became Lord of the Jungle and in doing so made Burroughs rich and famous. The All-Story magazine, under the pseudonym Norman Bean. 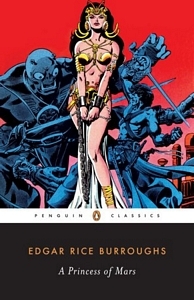 Warlord of Mars, published by Marvel Comics in April 1978. Zamyatin's We has received several cover treatments since Penguin first published it in 1972 and its reissue in Penguin Classics adds further variety. Initially the artwork used for the previous edition in 1993 was retained (left) but this has been replaced on the current edition (right) with a painting that offers a more straightforward connection to the story. Reissued in Penguin Classics 2007 (far left) with an introduction by Clarence Brown. 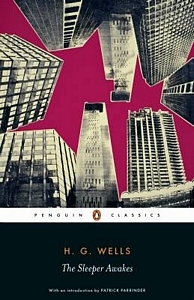 The cover shows Painting of Futuristic Buildings and City by Anton Brzezinski. Left: The book as first announced, showing Caricature of Aleksander Rodchenko (1933-4) by Georgii Petrusov. 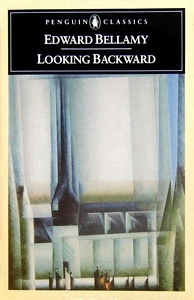 The early quartet of Penguin Classics by Abbott, Bellamy, Butler and Poe have all been reprinted using new-style covers, with Bellamy's Looking Backward getting a new cover painting that – like Zamyatin's We, above – is more in tune with the text. 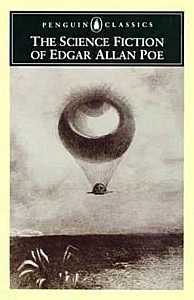 The other three titles have retained the artworks used for the previous black-and-cream Classics that paired Butler with Bellini, Abbott with Escher and Poe with Redon's strange balloon. 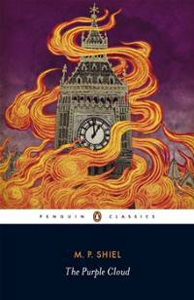 H G Wells had first joined the list of restyled Classics in 2005 with reissues of The Invisible Man, The War in the Air, The War of the Worlds, The Island of Doctor Moreau, The Time Machine and The First Men in the Moon, plus three sf titles that were new to Penguin – A Modern Utopia, The Sleeper Awakes and The Shape of Things to Come – with The Country of the Blind and Other Selected Stories following two years later. 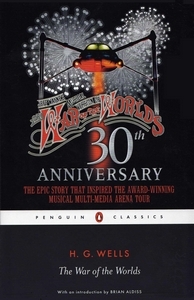 Then in 2008 The War of the Worlds was reprinted as a limited edition Penguin Classic to mark the thirtieth anniversary of the 1978 award-winning concept album Jeff Wayne's Musical Version of The War of the Worlds. The album had been turned into a live stage show in 2006 and the perform- ance at London's Wembley Arena in April of that year was subsequently released on DVD. The latter was re-released with the Penguin Classic as a thirtieth-anniversary boxed set two years later. 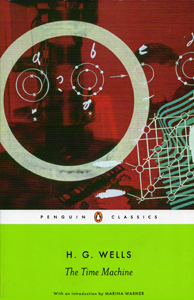 Reprinted as a limited edition Penguin Classic in November 2008 with an introduction by Brian Aldiss. The cover shows the thirtieth anniversary artwork for the 1978 concept album Jeff Wayne's Musical Version of The War of the Worlds. eyes, and slowly and surely, they drew their plans against us." 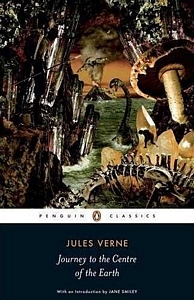 The War of the Worlds may be the most famous concept album to be based on an sf novel but it was not the first, as Jules Verne's Journey to the Centre of the Earth had been given a similar treatment four years earlier by Rick Wakeman, the former keyboard player in the prog-rock group Yes. Wakeman's Journey to the Centre of the Earth was recorded live at London's Royal Festival Hall in January 1974 and topped the UK albums chart on its release four months later. Reissued in Penguin Classics July 2009 with an introduction by Jane Smiley. The cover illustration is by Stephen Rothwell. M P Shiel's The Purple Cloud tells the story of a young English doctor named Adam Jeffson, who is the sole survivor of the first expedition to the North Pole. He returns alone across the ice and sea but everyone en route is dead, and when he reaches London the scale of the catastrophe is confirmed. For London, as elsewhere, is littered with corpses and Jeffson discovers that while he was away a volcanic eruption released a cloud of cyanide that has killed all humans, animals and birds. The prospect of being the last man alive fills him with horror and he becomes increasingly deranged. Consumed by madness and contrition he destroys London in a series of timed explosions and sets off again in search of survivors, burning cities as he goes, from Paris to Calcutta and San Francisco. For it seems he is alone in the world and the human race will end, as it began, with a man called Adam. 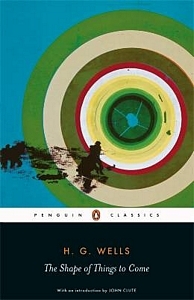 Published in Penguin Classics July 2012 with an introduction by John Sutherland. The cover illustration is by Yuko Shimizu.